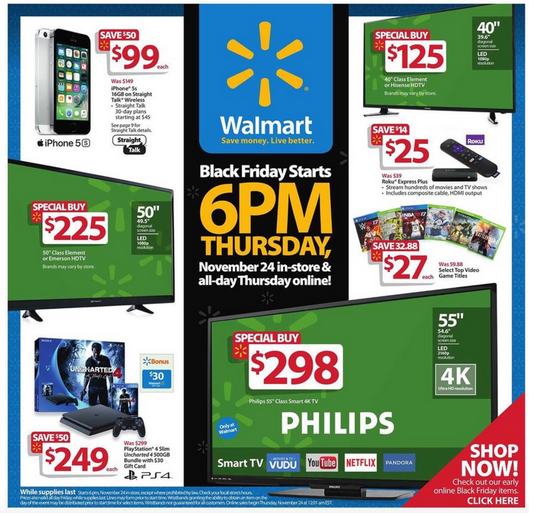 The Walmart Black Friday Ad for 2016 is HERE! Walmart’s online sales will begin at 12:01AM PST on Thanksgiving morning and at 6PM Thanksgiving Day in-stores. They also claim to be amping up their stock this year so that shoppers don’t miss out on their most wanted items. They will still feature their 1-Hour Guarantee on select items from 6PM to 7PM on November 26th. Remember, I will be staying up all night long to post the Walmart Black Friday deals when they go LIVE (this may be on Thanksgiving night or earlier) but I will be posting ALL the deals here so stay tuned! CVS: Kohl's $50 Gift Card only $35 with $15 ECB! Rite Aid: Noxema Razors only $2.99 with Coupon! Target: $10 off $50 Grocery Purchase Coupon! Rite AId: Nutella only 99¢ with Coupon!